With MeMD, you can consult a medical provider online or by phone - whenever and wherever. Talk to a Doc Now! 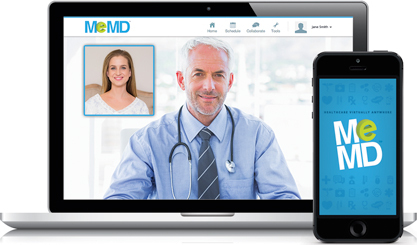 24/7 access to MDs, DOs, PAs and NPs by webcam or phone is now available to members. Why Wait at Urgent Care? Be treated from your home or office now. Sign in and complete your medical historyLog in for an online or phone consultation with one of our US licensed, board-certified medical providers. Visit with a provider 24/7Discuss your medical history and current health concerns with a MeMD provider. Get treatmentReceive a personalized treatment plan, and when medically needed, a prescription. MeMD medical consults are available to you by telephone or online via webcam. MeMD’s experienced staff of healthcare professionals can treat all of your common medical issues. Should you require a prescription it will be electronically routed through MeMD to the local pharmacy of your choice. MeMD provides online consultations with medical providers who possess prescriptive authority. MeMD does not dispense medications and is not an online pharmacy. Medications cannot be purchased through MeMD. MeMD is not a replacement for your primary care physician or annual office check-ups.